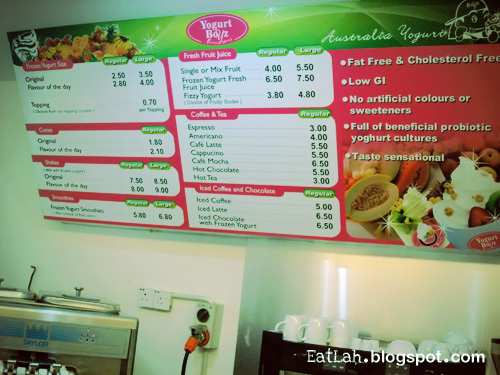 Yogurt Boyz @ Sri Petaling, KL | where and what to eat lah? Never really liked yogurt, but frozen yogurt is different! It's like smooth ice cream without the richness of ice cream, fat free, cholesterol free, low in GI, no artificial colors or sweeteners and full of beneficial probiotics. So hard to believe that this is actually good for you! I had my first frozen yogurt from YOGUR Plus in Tropicana City Mall for a whooping price of RM 5 in a small cup, but still considerably cheaper than Yogurberry and Tutti Frutti Frozen Yogurt. Nevertheless, it was nice, refreshing and sourly addictive. Unfortunately, YOGUR Plus came to an end probably due to lack of patronage. Till then, I have not had my frozen yogurt fix until I met Yogurt Boyz. 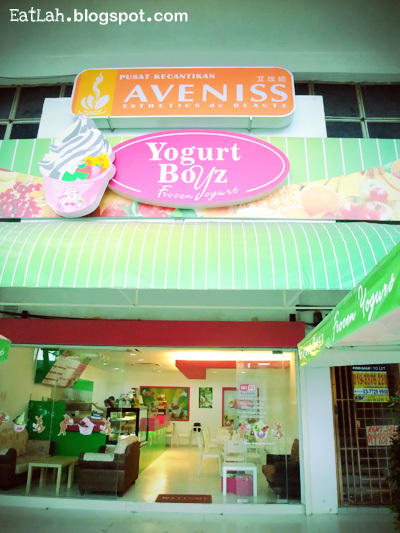 Yogurt Boyz is located in Sri Petaling, same row with Alison and all the dim sum restaurants. 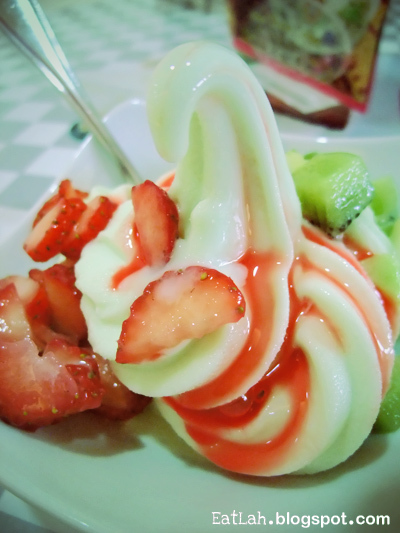 For few cents more, you can pick flavored yogurt which varies from kiwi to strawberry, raspberry, mango and many more. 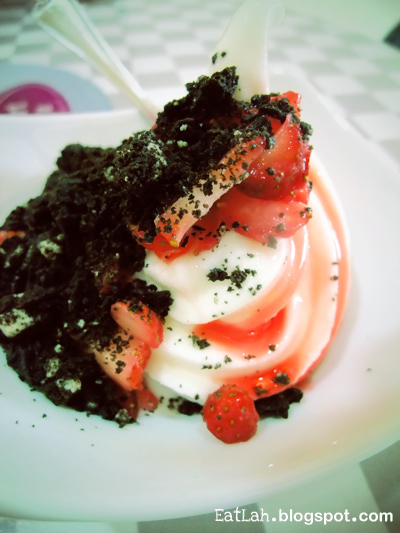 Original frozen yogurt with two toppings (freshly cut strawberries and Oreo bits) drizzled with Hershey's strawberry syrup (RM 3.90 RM 5.10) is the perfect match made. Cold zingy tang which is creamy smooth and icily refreshing! 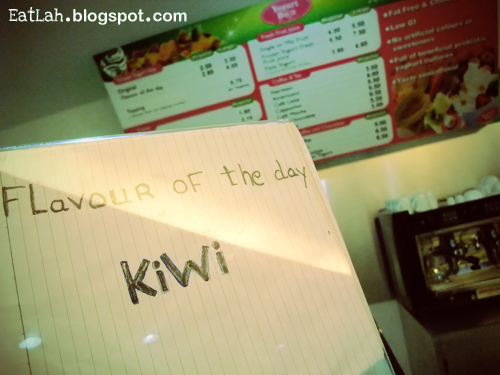 Kiwi frozen yogurt with two toppings (freshly cut kiwis and strawberries) drizzled with Hershey's strawberry syrup (RM 4.20 RM 5.60). 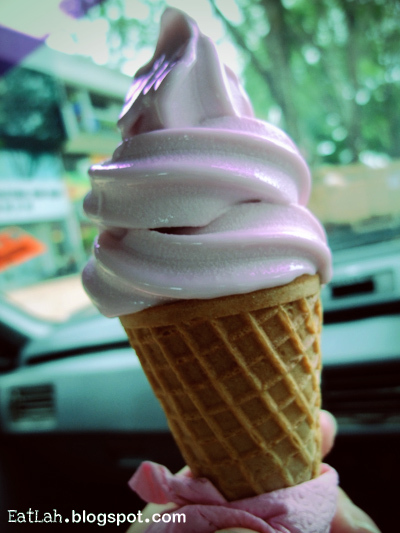 Whenever I passed by Sri Petaling, die die also I must tapau a single cone frozen yogurt (RM 1.80 RM 2) on the go. Surprisingly, how can this place be empty?!?! Something must be wrong here. Probably due to the location? Lack of proper deco? With the right pricing, I don't see what is stopping them from competing against the big boys that sell 2-3 times more expensive. Verdict: Totally worth it! Excellent place for cheap and good frozen yogurt if only you care less about the environment. Last visit (Oct 24, 2010): The environment gotten worse, you wouldn't feel comfortable sitting in here for more than 5 minutes. Most sad, the price went up and they've cut down on the yogurt mixing. It wasn't as sourish rich as before. Passed by this restaurant for several times but never tried it out. Looks nice.. Can't wait to give it a try!